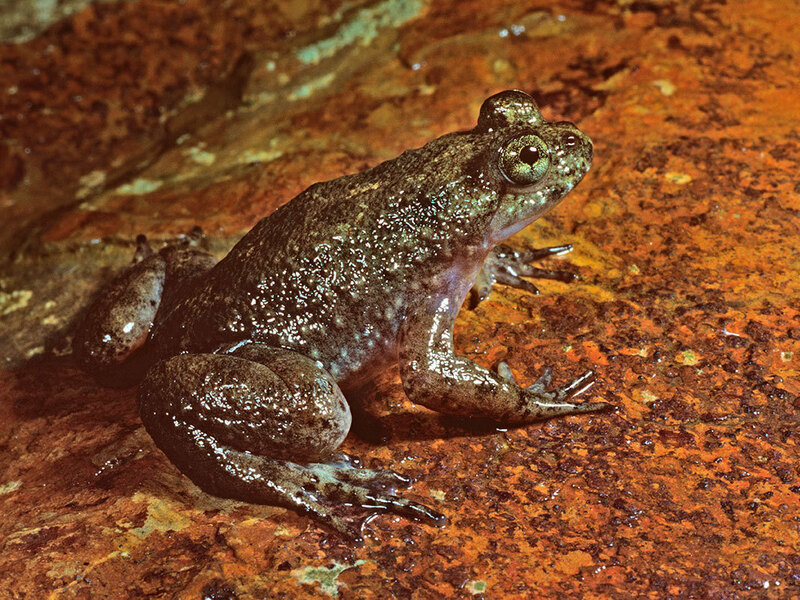 Resurrected Frog Gives Us Cause To Brood This week scientists announced they have reproduced the genome of an extinct amphibian, the gastric brooding frog. But animals are more than just their genomes, so NPR's Scott Simon wonders if it's necessary — or kind — to bring them back. This week scientists announced they have reproduced the genome of an extinct amphibian, the gastric brooding frog. The gastric brooder once lived in the rainforests of Queensland, Australia, and was declared extinct in 1983. It was not so named because it had the temperament of a Russell Crowe character, but because it gave birth through its mouth. So if you heard a female gastric brooder croak, "Excuse me while I clear my throat," you stood back. Professor Mike Archer says his team took tissue from a frog that had been dead and frozen since the 1970s and implanted it successfully in an egg from a closely related frog species. The embryos survived just a few days. But even a brief existence stirred excitement that this technique could lead to a way of recreating lost species. "We're increasingly confident that the hurdles ahead are technological, not biological," Professor Archer told The Guardian newspaper, adding that they've already begun work on cloning a Tasmanian tiger, which disappeared in the 1930s. Returning the Tasmanian tiger to life on Earth can seem to be a grace note of justice in a natural world that, on its own, can be "nasty, brutish, and short," as Thomas Hobbes phrased it. Other predators, including dingoes and human beings, are thought to have hunted the Tasmanian tiger to extinction. So isn't it somehow apt that human scientists apply their ingenuity to help bring it and other species back? Except, as some scientists and ethicists have pointed out, animals are not just their genomes. You might, someday, be able to bring back some incarnation of a Tasmanian tiger. But is it truly a Tasmanian tiger if there's not a parent around to show it how to be one? Would a Tasmanian tiger cloned and brought to life in a lab be just some kind of living, breathing facsimile, the way that Las Vegas creates replica Venetian canals or the Eiffel Tower? How necessary or kind would it be to create that kind of Tasmanian tiger? Right now a species is irreplaceable; that's why they're precious. I wonder if there are a few other things scientists could work to bring back from extinction first. Like thank-you notes. Twenty-four-hour diners. Condolence notes. People saying "ma'am" and "sir" to strangers. And base-runners stealing home on a two-strike pitch.